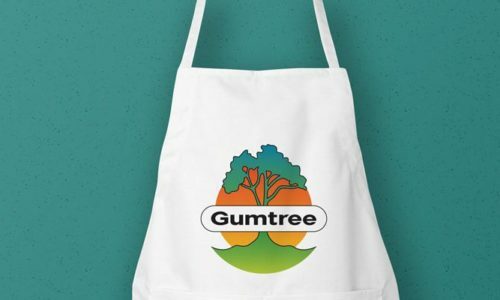 Manifest London contacted us as they were looking for 100 printed aprons and 100 printed tote bags for an event that was being hosted by GumTree – Upcycle Revolution. The aprons were for the participants to wear during the woodworking workshops where the participants were taught how to upcycle old pieces of furniture so that it didn’t go to waste. The workshop was with Max McMurdo, who is the Managing Director of a design agency called Restore. “Upcycled products don’t need to be compromised in terms of aesthetics, quality and desirability, if anything they should be more beautiful than soulless items” – Max McMurdo. When the client approached us for the printed aprons and tote bags, they provided us with an artwork file with designs that weren’t of the highest quality. This meant that we had to amend the files and make them print ready. The designs featured a lot of different colours and as a result of the artwork being vectored we recommended transfer printing the design onto the aprons and totes. However, we also decided to test to see if screen printing would also be suitable as it produces a higher quality print and is more environmentally friendly and durable, which is perfect when you’re running a workshop. Once the printing work was done we received another call from the client asking if we could also produce 150 pens and 150 notepads. We discussed the different options that we had and agreed on a price for the customer. We agreed that we would print the pens and sent them to the nearest print and embroidery locations to the customer so that the pens could be printed and dispatched from the same location within 2 days. The client was delighted with the service that we provided and has advised us that they would be using Garment Printing again for their future printing needs.